Teacher Recruitment Board Conducted PGTRB Exam Every year. Most of the people wanted To learn English language. Due to this reason the number of post graduated in English became high. The peo0ple of having master degrees in English are awaiting to write competitive Exams for getting the Government job. In particularly so many of them choose the profession of teaching and write PGTRB Exams. 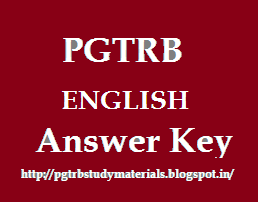 For helping these enthusiastic candidates we uploaded the PGTRB English Exam papers with Answers Keys of all years.